In medium bowl, beat all crust ingredients with electric mixer on low speed about 1 minute or just until blended. Press mixture on bottom and up side of ungreased 9-inch glass pie plate; prick mixture with fork. Refrigerate 30 minutes while preparing filling. In 2-quart saucepan, mix 2/3 cup sugar, the cornstarch and salt. In large bowl, beat milk and egg yolks with wire whisk until blended; gradually stir into sugar mixture. Cook over medium-low heat about 15 minutes, stirring constantly, until mixture thickens and boils. Boil 2 minutes, beating constantly with wire whisk; remove from heat. Beat in 2 tablespoons butter and 1 tablespoon vanilla with wire whisk. Press plastic wrap on filling to prevent a tough layer from forming. Cool at room temperature while baking crust. Heat oven to 400°F. Bake crust 16 to 18 minutes or until edge is golden brown. Cool at room temperature 15 minutes. 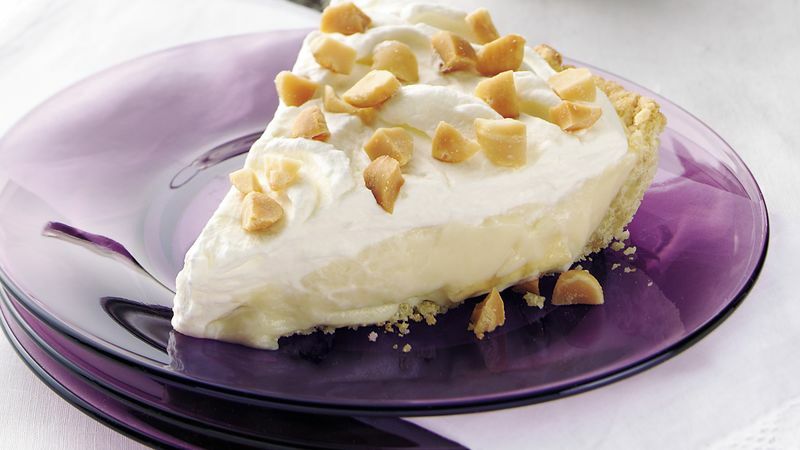 Place banana slices on pie crust. Stir filling well; pour filling over bananas. Press plastic wrap on filling; refrigerate at least 2 hours until thoroughly chilled. In chilled small bowl, beat whipping cream and 2 tablespoons sugar on high speed until soft peaks form; spread over top of pie. Sprinkle with toasted nuts. *To toast nuts, bake uncovered in ungreased shallow pan in 350°F oven 6 to 10 minutes, stirring occasionally, until golden brown. Pecans or walnuts can be substituted for the macadamia nuts. For a chocolate version of this pie, add 2 ounces unsweetened baking chocolate to the filling with the milk and egg yolks.